Rocky Hill, CT (April 9, 2019) – The Connecticut Green Bank is pleased to announce the sale of $38.6 million investment-grade rated ABS notes. This innovative first-of-its-kind issuance monetizes the solar home renewable energy credits (SHRECs) generated through the Residential Solar Investment Program (RSIP). The sale was comprised of two tranches of SHRECs produced by more than 105 megawatts of 14,000 residential solar photovoltaic (PV) systems. The SHRECs were aggregated by the Green Bank and sold in annual tranches to Connecticut’s two investor-owned utilities, Eversource Energy and United Illuminating Company, at a fixed, predetermined price over 15 years. The funds raised through this sale will recover the costs of administering and managing the RSIP, including the incentives offered to residential participants in the program. The Green Bank worked with Kestrel Verifiers to certify that this issuance conforms with the Climate Bonds Standard. Further, it partnered with the Climate Action Reserve (CAR) to independently assess the impact of the systems in tranches one and two of the SHRECs. CAR estimates that these systems will produce 238,000 MWh of electricity each year, avoiding the emission of approximately 749,494 tonnes carbon dioxide equivalents (tCO2e) of greenhouse gases (GHGs). CAR leveraged the Environmental Protection Agency’s (EPA) Avoided Emissions Generation Tool (AVERT) and Co-Benefits Risk Assessment (CoBRA) in their assessment of air quality and public health impacts respectively. RBC Capital Markets was the sole book runner in this transaction. DANBURY, CT (Nov. 05, 2018) — FuelCell Energy, Inc., a global leader in delivering clean, innovative and affordable fuel cell solutions for the supply, recovery and storage of energy, today announced that it has entered into an agreement to acquire the existing 14.9 megawatt fuel cell park in Bridgeport, CT from Dominion Energy. FuelCell Energy developed, constructed and commissioned the Bridgeport fuel cell park in December of 2013. FuelCell Energy has operated and maintained the plant under a service agreement with Dominion Energy since it was commissioned. Be accretive to FuelCell Energy’s earnings per share. Under the terms of the agreement, FuelCell Energy will acquire 100% of the equity interest in Dominion Bridgeport Fuel Cell, LLC, the owner of the 14.9 MW project asset, whose parent is currently Dominion Energy. This agreement is the result of a competitive bid process undertaken by Dominion Energy. Total cash consideration to be paid is $36.6 million. FuelCell Energy expects to fund the acquisition with a combination of third party financing and $15 million of restricted cash on hand that is tied to the project and would be released at closing. Financing for this acquisition is expected to include a term lender and the Connecticut Green Bank, who also participated in the initial financing of the construction of the project. The closing of this transaction is expected to happen on or before December 31, 2018, subject to customary closing conditions and contingencies including closing third party financing. This acquisition will bring Fuel Cell Energy’s generation portfolio to 26.1 MW, which coupled with 83 MW of new project awards and backlog, provides a line of sight to achieving the company’s long-term generation portfolio milestone of 60 MW. This news release contains forward-looking statements within the meaning of the safe harbor provisions of the Private Securities Litigation Reform Act of 1995, including, without limitation, statements with respect to the Company’s anticipated financial results and statements regarding the Company’s plans and expectations regarding the continuing development, commercialization and financing of its fuel cell technology and business plans. All forward-looking statements are subject to risks and uncertainties that could cause actual results to differ materially from those projected. Factors that could cause such a difference include, without limitation, changes to projected deliveries and order flow, changes to production rate and product costs, general risks associated with product development, manufacturing, changes in the regulatory environment, customer strategies, unanticipated manufacturing issues that impact power plant performance, changes in critical accounting policies, potential volatility of energy prices, rapid technological change, competition, and the Company’s ability to achieve its sales plans and cost reduction targets, as well as other risks set forth in the Company’s filings with the Securities and Exchange Commission. The forward-looking statements contained herein speak only as of the date of this press release. The Company expressly disclaims any obligation or undertaking to release publicly any updates or revisions to any such statement to reflect any change in the Company’s expectations or any change in events, conditions or circumstances on which any such statement is based. In Connecticut, the Green Bank is evaluating a plan to create a revenue stream for owners of EV infrastructure; owners should register their equipment now. Rocky Hill, CT (June 15, 2018) – The Connecticut Green Bank is proud to announce a pilot program that will make Commercial Property Assessed Clean Energy (C-PACE) financing available for new construction in Connecticut. The C-PACE New Construction Pilot will provide property developers and owners with long-term, affordable and non-recourse financing to help them design and construct buildings that achieve a higher level of energy performance and reduced operating costs. C-PACE New Construction can fill gaps in the capital stack needed for a new construction project, lower the overall cost of financing, or both. New commercial and industrial buildings designed and built to exceed what is required by Connecticut building and energy codes will be eligible to receive C-PACE financing for a portion of their overall eligible construction cost. C-PACE New Construction can be applied for a wide range of property types, including major redevelopment of existing and historic sites. When applying for C-PACE financing in the C-PACE New Construction Pilot, applicants will use whole building energy modeling to demonstrate that their project’s energy performance will exceed a code-compliant baseline. An eligible finance amount will be determined based on the performance beyond the baseline up to a maximum 20 percent of the total eligible construction cost. Applicants seeking funding through the C-PACE New Construction Pilot should discuss and review their projects with the Green Bank before submitting a financing application. This engagement ahead of application submission will help ensure that projects meet the requirements of the C-PACE New Construction Pilot. Learn more about the Pilot at http://www.cpace.com/newconstruction. The Green Bank is partnering with the Clean Energy States Alliance on a multi-state initiative to identify locations for distributed energy resources that provide benefits to the grid. Rocky Hill, Connecticut (May 1, 2018) – The Connecticut Green Bank is participating in a multistate initiative that was selected by the U.S. Department of Energy’s National Renewable Energy Laboratory (NREL) to participate in a collaborative research effort to explore new ways solar energy can improve the affordability, reliability, and resiliency of the nation’s electric grid. The multistate initiative is being led by the Clean Energy States Alliance (CESA), a national nonprofit coalition of public agencies and organizations working together to advance clean energy. The Green Bank will work with CESA and five other state partners to identify locations for distributed energy resources (DER) that provide benefits to the grid. The Green Bank’s work will focus on strategies for achieving customer adoption of DERs in high-value locations and measuring the impact these resources have on the electric distribution system. The multistate initiative is one of just nine teams selected to join the program, which is known as the Solar Energy Innovation Network. “We selected teams that are experimenting with promising ideas to use solar power to improve the future of grid security and reliability in their communities,” said Kristen Ardani, who leads the Innovation Network at NREL. The Green Bank will receive financial, analytical, and facilitation support as it works to anticipate and address new challenges and opportunities stemming from solar energy and other distributed energy technologies. The solutions developed and demonstrated by this multistate initiative will serve as a blueprint for other communities facing similar challenges and opportunities. NREL is operating the Solar Energy Innovation Network with funding from the U.S. Department of Energy Solar Energy Technologies Office. NREL pursues fundamental research and development of renewable energy and energy efficiency technologies to transform the way we use energy. The Community Preservation Corporation (CPC) and the Connecticut Green Bank are now working together to offer you a simple way to improve the energy efficiency, cost savings, comfort, safety and attractiveness of your multifamily property. This joint effort combines a Navigator Pre-Development Energy Loan with a HUD 223(f) loan or a Freddie Mac Small Business Loan (SBL) offering. The unsecured Navigator loan funds customized analysis and design of energy improvements for multifamily properties using owner-selected and managed technical service providers. Read more about how a Navigator Loan with HUD/FHA or Freddie Mac financing works. Ask your mortgage officer how we can help tailor a lending solution to fit your needs, and find out if we can underwrite to savings for sustainability improvements. For more information about CPC, please contact Michael Staton or Timothy Deegan. Middletown, CT – March 2018 – The Middlesex County Chamber of Commerce announced a new initiative to help local businesses afford renewable energy and energy efficiency upgrades. The effort is a collaboration between the Chamber, the Connecticut Green Bank, and Chambers for Innovation and Clean Energy. The team will help local businesses take advantage of C-PACE (Commercial Property Assessed Clean Energy), an innovative financing program for green energy upgrades. C-PACE offers long-term financing for projects that lower energy costs and generate positive cash flow. The initiative’s official announcement was made at the Chamber’s Member Breakfast Meeting on February 26, 2018. Pictured, from left to right, are: Larry McHugh, President, Middlesex County Chamber of Commerce; Mackey Dykes, Vice President of Commercial and Industrial Programs, Connecticut Green Bank; Robert Schmitt, Associate Manager, Marketing, Connecticut Green Bank; and Jeff Pugliese, Vice President, Middlesex County Chamber of Commerce. The Middlesex County Chamber of Commerce is a dynamic business organization with over 2,125 members that employ over 50,000 people in and around its service area. The chamber represents businesses from all industry sectors and of all sizes, from Fortune 500 companies, to micro businesses. The team will reach out to the business community in a variety of strategic ways, and will highlight local businesses who have saved through the program. The initiative will target all eligible local businesses including manufacturers, offices, retail establishments, business in mixed use spaces, and non-profits. To learn more about the collaboration, please visit middlesexchamber.com or cpace.com. 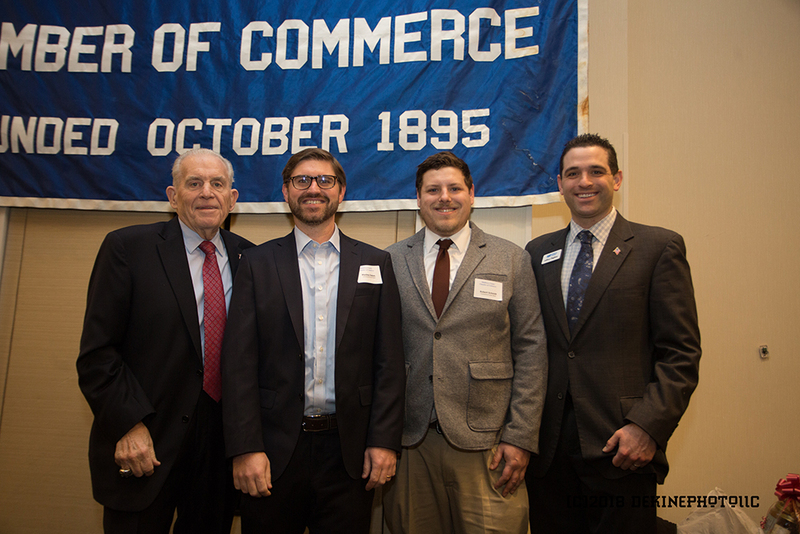 The Middlesex County Chamber of Commerce is a dynamic business organization with over 2,125 members that employ over 50,000 people in and around its service area. The chamber represents businesses from all industry sectors and of all sizes, from Fortune 500 companies, to micro businesses. It has 12 county based divisions, and over 30 industry based committees and councils that focus on issues of importance to the business community. The Middlesex County Chamber of Commerce has been honored with the Governor’s Laurel Award for Responsible Social Involvement, The President’s White House Citation for Private Sector Initiatives, the U.S. Department of Labor’s LIFT America Award, Connecticut Small Business Advocate Award, Vision 2000 Excellence Award, and the NAACP Business Award. Please visit www.middlesexchamber.com for more information. Rocky Hill, CT (Jan. 30, 2018) – The Connecticut Green Bank announces that the state’s Commercial Property Assessed Clean Energy (C-PACE) program has surpassed 200 closed projects totaling more than $114 million in clean energy investment in businesses. C-PACE is an innovative program that is helping commercial, industrial and multi-family property owners access affordable, long-term financing to save money and make smart energy upgrades to their buildings. According to PACENation, an industry group promoting Property Assessed Clean Energy (PACE) financing, Connecticut is second only to California in total dollars financed through C-PACE. The Connecticut Green Bank, the nation’s first full-scale green bank, leverages limited public dollars to attract private investments that scale-up renewable energy deployment and energy efficiency projects across the state. Of the capital deployed through the Green Bank’s C-PACE program 70 percent comes from private investors, including from a $100 million facility established with a private sector investor, and C-PACE projects originated and financed through other capital providers. The Green Bank has also securitized and sold C-PACE transactions in the past. The Green Bank’s administration of the program ensures that investors are confident using their capital to finance C-PACE projects. In 2017, 50 projects closed on financing through the Green Bank’s C-PACE program – these projects will provide an estimated cost savings of $8.6 million, create 119 job years and will result in 6,653 kW of installed solar PV capacity. Cumulative program total for installed capacity is now nearly 25,000 kW and total job years now exceeds 1,300. In total, Connecticut’s C-PACE projects will produce an estimated $204.5 million in energy cost savings reducing the burden of energy costs on businesses and non-profit organizations across the state. The Green Bank also reports that Q3 and Q4 of calendar year 2017 were the best back-to-back quarters in number of closed projects (36) since the C-PACE program’s inception in 2013. Click here to read more about the 200th project. For more information on C-PACE, please visit http://www.cpace.com. 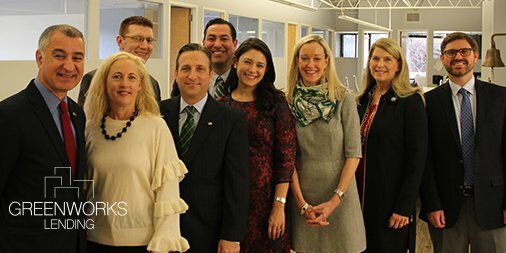 Pictured are: (front row, L-R) Carlo Leone, CT State Senator; Pamela Sparkman, Board of Selectmen, Darien; Bob Duff, CT State Senate Majority Leader; Alexandra Cooley, CFO & Co-founder Greenworks Lending; Jessica Bailey CEO & Co-founder, Greenworks Lending; Jayme Stevenson, First Selectman, Darien; Mackey Dykes, Vice President Commercial and Industrial Programs, Connecticut Green Bank. Second Row (L-R) Matt Macunas, Senior Marketing Manager, Connecticut Green Bank; and Bryan Garcia, President and CEO, Connecticut Green Bank. Darien, CT (December 6, 2017) – Greenworks Lending, a Darien-based specialty finance firm that deploys private capital in support of energy efficient and renewable energy investments made by commercial properties, brought local and state legislators together with Connecticut Green Bank leaders to discuss the firm’s growth and economic development in the clean energy investment industry via an effective public-private partnership and public policy. Senate Majority Leader Bob Duff, Senator Carlo Leone, Darien First Selectman Jayme Stevenson and Selectman Pamela Sparkman were in attendance. Using the Commercial Property Assessed Clean Energy (C-PACE) program, Greenworks financed projects to date will reduce carbon dioxide output equivalent to transforming all of Darien north of I-95 (roughly 16 square miles) into a forest for 20 years. Greenworks Lending is a woman-owned enterprise founded by two former directors from the state’s Connecticut Green Bank. This clean energy and energy efficiency finance company is the fastest-growing firm in Connecticut by percentage growth, and recently closed an industry-first $75 million AA-rated securitization transaction. They are helping to scale the market for private investment in energy-saving commercial property improvements with the state’s C-PACE program. This helps commercial property owners and tenants save money and improve cash flow, while supporting jobs in the growing clean energy and energy efficiency industries. For more information on Greenworks, please visit https://www.greenworkslending.com/. For more on C-PACE, please visit www.cpace.com. Rocky Hill, CT (Nov. 2, 2017) – The U.S. Department of Energy’s SunShot Prize: Race to 7-Day Solar, a national competition intended to reduce the time it takes to “go solar” across the country, has ended, and the Connecticut Permit to Plug-in Challenge team was among the two final participants. While neither team was eligible for the grand prize, both teams made impressive progress and were given an award of distinction for their efforts. The Connecticut Permit to Plug-in Challenge team was comprised of the Connecticut Green Bank, and the state’s investor-owned utilities, Eversource Energy and the United Illuminating Company, as well as solar installers representing nearly 60% of the state’s solar market, and many municipalities. Working together, they created a multi-pronged strategic approach to reducing solar installation times, and relied on detailed project tracking and evaluation, which enabled them to inform and replicate strategies that positively impacted project completion times. According to the challenge’s criteria, to win the competition’s $3 million grand prize, teams needed to get a minimum of 2,250 points and complete 85% of its total installed capacity in 56 days or less. The Connecticut Permit to Plug-in Challenge team reported the installation of 1,501 systems in 49 participating municipalities covering 141 different zip codes. The systems that were installed averaged 8.74 kW, resulting in 13.03 MW of total installed solar capacity. The median total time, from permit to plug-in was 89 days and 78.6% of its total installed capacity was completed in 56 days or less. To attain this success, the team worked closely to identify and implement process improvements for solar installations across the value chain. The competition enabled the team to create resources that walk residents through the permit to plug-in process, standardize aspects of municipal solar permitting processes, and implement improvements to the utility interconnection process for solar PV. The other final team was the Northern and Central California SunShot Alliance, who completed 80% of their total installed capacity in 56 days or less. While California was not able to meet the minimum point threshold for a grand prize, they completed the competition with 1,780 points – only 10 points more than Connecticut.